Prestigious award recognizes three-decade of commitment in making quality healthcare affordable and accessible. 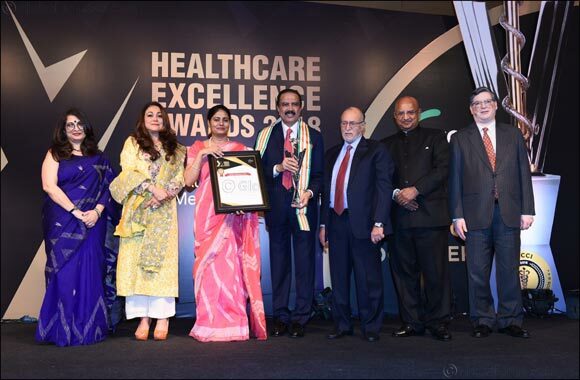 Dubai, UAE, September 01, 2018: Dr. Azad Moopen, Founder Chairman and Managing Director of Aster DM Healthcare, has been honoured with the Lifetime Achievement Award at 10th edition of The Federation of Indian Chambers of Commerce (FICCI) Healthcare Excellence Awards. The prestigious accolade is in recognition of his valuable contribution and efforts in the field of healthcare. Under his leadership, Aster DM Healthcare in the last 31 years has become one of the few entities across the globe providing the complete circle of care from primary, secondary, tertiary to quaternary medical care. Starting with a single doctor clinic in Dubai in 1987, when healthcare was still in its primitive stages in the region, Dr. Moopen has played a significant role in shaping the healthcare industry in UAE and GCC. Today Aster DM Healthcare has grown into an integrated healthcare conglomerate of over 300 establishments including hospitals, clinics, pharmacies and diagnostic centres spread across nine countries. The Company was also listed in the Indian Stock Market in February 2018. Guided by the philosophy of providing easy access to quality healthcare at affordable costs, Dr. Moopen has revolutionized healthcare services by creating a model that is accessible to different income groups and masses without compromising the service aspect of the noble medical profession. Accepting the award at a ceremony in New Delhi, Dr. Moopen paid tribute to Aster DM Healthcare’s 17,000+ staff members for their efforts in providing “compassionate care to millions of patients” and hard work to keep pushing the boundaries of healthcare excellence. “Our journey over the last 30 years has been driven by our vision to provide quality healthcare at affordable costs at the doorstep of the people that we serve and pushing boundaries to achieve our mission has seen us set benchmarks in healthcare excellence. I would like to thank FICCI for this honour, and this serves as further motivation to continue making a positive difference in the lives of the people that we serve everyday,” Dr. Moopen said. A dedicated philanthropist, Dr. Moopen has embarked on numerous social initiatives through Aster DM Foundation and Dr. Moopen Family Foundation. He believes that profit is a by-product and not a purpose in healthcare, and his initiatives in the field of healthcare, education, women and social empowerment are providing hope to millions across geographies. He has earmarked 20 per cent of his personal wealth for philanthropic activities enabling social change and helping people in need. In 2011, the Government of India honoured him with the Padma Shri title and in 2010 with Pravasi Bhartiya Samman for his extraordinary contribution in the healthcare sector. In 2009, he was also conferred the best doctor award by government of Kerala. In 2018, Dr. Moopen received the ‘Lifetime Achievement Award’ at the Gulf Indian Leadership Summit, and was recognized as one of the 100 most inspiring leaders in the Middle East by Arabian Business Magazine. He has also been recognised as one of the Top powerful Indian leaders in the Arab World by Forbes Middle East magazine. Next Story : Dubai Health Authority discusses back-to-school health tips.